Surprise! I’m still alive and kicking. And writing, although you wouldn’t know it to see how I’ve neglected this blog. Today, however, I ran across a video from Britain’s Got Talent that’s too good not to share. Hear it here and you can say you heard it when, because it won’t be long before this one is working its way up the charts. We can only hope bullies hear it and take the words, and the emotions behind them, to heart. Listen and be moved. Posted by Karen Coombs on March 27, 2015 in Uncategorized. Every day after school, Tink waits in ambush for Rocky. Every day after school, Tink is waiting at Ambush Corner to use 11-year-old Rocky for a punching bag. He can't tell his parents. His father will encourage him to stand up for himself and fight back. His mother, worried that Rocky will break a finger and not be able to play his viola in the upcoming music competition, will forbid him to fight at all. What neither parent knows is that Rocky thinks fighting is stupid and has decided to become a pacifist, a secret Rocky is keeping even from his best friend, Mario, who might not approve of Rocky's wish to be peaceable. Rocky tries all sorts of plans to end the bullying without success, even recruiting his older sister, who steps in, only to make the situation worse. Eventually, however, Rocky's music teacher helps him understand Tink's behavior, which gives Rocky a new idea to try. Will he be able to end the daily bullying, gain his father's approval, win the music competition, and still practice being a pacifist? 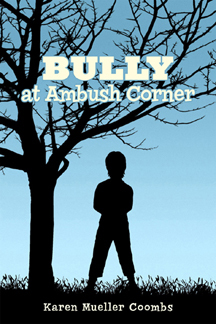 A book about a serious subject told with a touch of humor, Bully at Ambush Corner includes a discussion guide, as well as links to Internet sites that deal with bullying.